Buy Lifebuoy Active Fresh Hand Wash Refill Pack 185ml + Active Detergent Bar Wheel Blue 125Gm + Liril Lime Rush 75Gm at just Rs.77 2. Flat 6% off 3. Order now! Best Deal!! 4.Happy Shopping. Buy Pears Oil Clear & Glow Soap 2Pcs + Lifebuoy Hand Wash Total Protect Germ Protection Refill 185ml + Wheel Active Detergent Bar Blue 3Pcs at just Rs.130. Free Same day delivery. Happy Shopping. Sign up & get 10% off on your next three order at Shoppeboard. No coupon code required. Offer valid for a limited period. Get free shipping on order above Rs.800 only at Grocerybounty. No coupon code required. Offer valid for limited period. Grab 50% off on grooming and wellness at Myshopbazzar. No coupon code is required. Hurry!!! offer valid only for a limited period. Get free shipping on prepaid order above Rs.699 at Puremart. No coupon code required. offer valid for limited period. Buy organic food rice & flour starting @ Rs.180 at Mygreenkart. No coupon code required. Offer valid for limited period. Get Flat 10% off on your all grocery purchase at Shoppeboard. Use coupon code to avail this offer. valid for limited period. Shop Rs.1000 & above per order and get free trendy umberlla at Biggmart. Use coupon code to avail this offer. Hurry!!! offer valid for limited period. Get up to 20% off on groceries at Shoppeboard. No coupon code required. Offer valid on products displayed on the landing page. Get up to 36% off on areva lifestyle pomace olive oil 500ml and extra virgin olive oil 250ml @ Rs.399 at Grocerybounty. No coupon code required. Get polyset 9pcs super lock container set @ Rs.399 at Grocerybounty.No coupon code required. Valid for limited period. Get kissan sauce fresh tomato ketchup 1kg + Brooke bond tea red label 250gm. No coupon code required. You save Rs.24. Order now! Best Deal!! Happy Shopping. Get up to 20% discount on groceries and daily need products at Shoppeboard. No coupon code required. Offer valid on products displayed on the landing page. Get baby care accessories starting @ Rs.35 at Grocerybounty. No coupon code required. Give us your email so we can send you Grocery Coupons once a day and our biweekly newsletter. Order grocery online & use grocery coupons to get exclusive discounts on your order. You can now order grocery from Grofers, Askmegrocery, nature's basket & many other online grocery sites. Shop for all your daily & monthly grocery needs online. 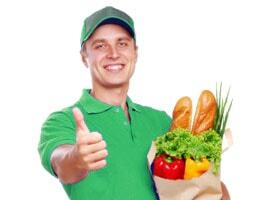 You can order from grocery stores near to your place & get it delivered. All the food items are fresh & new. Get free home delivery when your order grocery online. You will find lot of deals on food items when your order grocery online. Check out for grocery coupons of grofers, bigbasket, nature's basket to get additional discount. Online grocery is now available across many states. You can order grocery online in Delhi, Bangalore, Chennai, Kolkata, Mumbai & other major cities. All the latest offers for grocery are listed here.